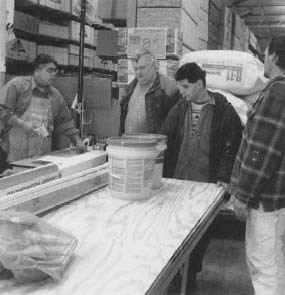 The subtitle of their 1999 book, Built From Scratch, tells their story in a nutshell: "How a Couple of Regular Guys Grew the Home Depot from Nothing to $30 billion." In this case, the "regular guys" are Bernie Marcus and Arthur Blank, longtime friends and founders of Home Depot, Inc. Since they started the company more than twenty years ago, the two men have weathered downturns in the economy, lawsuits, competition, and other adversities to become the world's largest chain of home improvement stores. Today, Home Depot has fourteen hundred stores, more than a quarter of a million employees, and sales of nearly $60 billion per year. The Home Depot story started in the early 1970s when Marcus and Blank were executives at Handy Dan, a chain of home improvement stores owned by the now-defunct Daylin Corporation. The owner of Daylin, Sandy Sigoloff, called himself Ming the Merciless, after a villain from the Flash Gordon movie serials of the 1930s. His management style was ruthless, reflecting his nickname, and he was proud of it. In 1978, Sigoloff fired Marcus and Blank. As it turned out, being fired was one of the best things that ever happened to them. Losing their jobs allowed the two friends to develop an idea Marcus had been thinking about for several years—opening a chain of hardware and home improvement superstores across the country unlike anything that existed at the time. Marcus and Blank drew on the experiences of two other friends and retailers: Sam Walton, founder of Wal-Mart (see entry), and Sol Price, founder of the Price Club. The pair also sought financial help from another friend who had been fired by Sigoloff, Texas billionaire H. Ross Perot (1930-). When their deal with Perot fell through, Marcus and Blank got the $2 million they needed from another group of investors; they were given two years to get their business started. With money in hand, the pair was ready to go. They leased three vacant buildings from J.C. Penney in Atlanta, Georgia, deciding that city was the best place to launch their first stores. They secured another loan of $3.5 million, which they used to purchase inventory. They also hired twenty employees to help run the management end of the business. 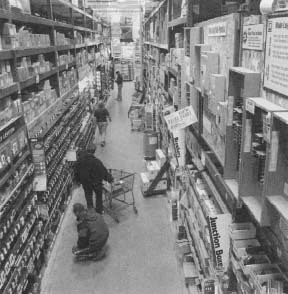 On June 22, 1979, the first three Home Depot stores, staffed by two hundred workers, opened in Atlanta. The company began with Marcus as chairman of the board of directors and chief executive office (CEO), and Blank as president. Although Home Depot had $7 million in sales its first year, it lost $2 million. In 1980, it opened a fourth store in Atlanta and added one hundred employees, which helped boost sales to $22 million that year. From there, the company grew rapidly, opening new stores, and posting increased sales and profits each year. By the end of 1981, Home Depot had eight stores, including its first in Florida. Marcus and Blank took the company's stock public, meaning shares of the company could be purchased by the public on the New York Stock Exchange. This raised just over $4 million. The following year, the stock split three times and the company started an employee stock-purchase plan. This allowed workers to have a percentage of their salary deducted from their paychecks and used to purchase Home Depot stock. In effect, the employees who bought the stock owned part of the company. As of 2002, employees owned about 25 percent of Home Depot stock. The year ended with the company operating ten stores with over one thousand employees. It posted sales of $118 million. Bernie Marcus and Arthur Blank open the first three Home Depot stores in Atlanta, Georgia. Home Depot offers its stock to the public; opens stores in Florida. Stores open in Arizona and Louisiana. Company posts sales of $700 million; opens stores in California. Home Depot has ninety-six stores at year's end. Annual sales reach $3.8 billion at 145 stores. Company opens first EXPO Design Center in San Diego, California. Home Depot expands into Pacific Northwest. Company opens stores in Canada; annual sales are $12.5 billion. Blank replaces Marcus as CEO. Built From Scratch by Marcus and Blank is published. Company acquires Total HOME, a four-store chain in Mexico; annual sales top $53 billion. Robert L Nardelli becomes CEO. 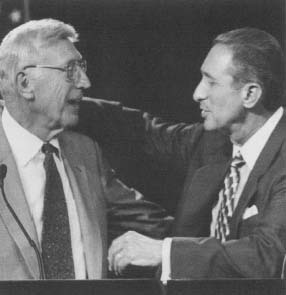 Bernie Marcus and Arthur Blank, founders of Home Depot. From 1982 to 1983, the company doubled in size. With openings in Arizona and Louisiana, Home Depot ended 1983 with nineteen stores, over two thousand employees, and $250 million in sales. One of the reasons for the huge success of the company was its shrewd strategy of purchasing large quantities of an item at a very low price and then reselling the item at only a slight profit. These "advertised specials" worked to bring large numbers of people into the stores to buy a specific product. While in the store, many customers then purchased other merchandise. For example, in 1981 Blank found a supply of ceiling fans that he was able to get for $27 each. Although these fans would normally be marked up to retail for about $50, Blank priced them at $30. This means the company would make only a $2.00 profit per fan. Such a low profit margin was relatively unheard of in hardware and home improvement stores at the time. But what the company may have lost in a low markup, it made up for in volume. Three days after the sale was advertised, the stores had sold forty thousand fans. From the start, Blank and Marcus felt that offering exceptional customer service was one of the keys to success. "If I ever saw an associate [salesperson] point a customer towards what they needed three aisles over, I would threaten to bite their finger," Marcus wrote in Built From Scratch. "I would say, 'Don't ever let me see you point. You take the customer by the hand, and you bring them right where they need to be and you help them.'" Doing whatever it takes to build customer loyalty. Treating all employees with respect, including always paying more than the minimum wage. Developing an entrepreneurial spirit that allows many decisions to be made at the store level. Marcus and Blank thought of the Home Depot's organizational structure as an inverted pyramid, with stores and customers at the top and senior management on the bottom. Showing respect to all people, regardless of race, religion, gender, income, or education. Giving back to the community, not just by donating money to charitable causes, but by encouraging employees to actively take part in such efforts by donating their time and experience. Ross Perot (1930-) did not help H• Bernie Marcus and Arthur Blank launch Home Depot because of a quirky situation over the type of automobile Marcus drove. When Perot found out Marcus drove a Cadillac, the billionaire told him that all his executives had to drive Chevrolets. In their book, Built From Scratch, Marcus wrote of Perot, "If this guy is going to be bothered by what kind of car I'm driving, how much aggravation are we going to have when we have to make really big decisions?" The 1980s, 1990s, and beginning of the twenty-first century saw a large increase in the number of people interested in do-it-yourself home improvement. 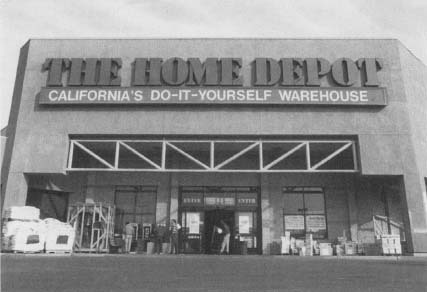 when the first Home Depot stores opened in June 1979. Without them, we're no different than our competition. From 1984 through 1989, the company continued to steadily expand. By the end of 1989, Home Depot had 118 stores from coast to coast, 17,500 employees, and annual sales of $2.7 billion. During 1987, sales increased by 45 percent. This came not only from opening new stores, but also from increasing sales at existing stores by 18 percent. For most retail chains at the time, a 5 percent increase was considered good. Much of this success is because Home Depot convinced people that they could do many home repairs and improvements themselves. According to a 1988 article in Fortune, "What sets Home Depot apart from mere discounters is the company's mission to make a Mr. or Ms. Fixit out of someone who thinks about calling the plumber to change the bath water." From almost the beginning, the stores offered a wide variety of free classes, ranging from how to replace a toilet to building a patio deck. This became particularly important whenever there was a slump in new home construction because of a poor economy. Instead of buying a new house, many people took on remodeling projects and they turned to Home Depot for help and supplies. The 1990s saw a ten-fold increase in annual company sales, going from $3.8 billion in 1990 to $38.4 billion in 1999. By the end of the decade, Home Depot had 930 stores and 201,000 employees. It also established two specialty stores: EXPO Design Center and Villager's Hardware. The first EXPO Design Center opened in San Diego, California, in 1991. The stores are 150,000 square-feet, and feature eight interior design departments, including kitchen, bath, lighting, and carpeting. As of 2002, Home Depot had forty-eight EXPOs in fourteen states. The first Villager's Hardware, the company's attempt to get into the $50 billion a year convenience hardware market, opened in 1999 in East Brunswick, New Jersey. But after only three years and four stores, Home Depot scrapped the idea and converted the stores into Home Depots in 2002. In 2001, Bernie Marcus and Arthur Blank showed that they truly believed in leading by example when they both agreed not to accept bonuses they were entitled to. The combined amount was $5 million. At the time, the company was going through budget cuts because of declining profits. Just a few years earlier, however, Home Depot had a chink taken out of its corporate values armor. In 1997, the company settled four gender discrimination lawsuits, although it did not admit having done anything wrong. Home Depot agreed to pay a total of $104 million. Of this, the company paid $65 million to thousands of female workers on the West Coast, $22.5 million in legal fees, and $17 million to overhaul its employment programs. As part of the agreement, Home Depot also set up a procedure to help more women get sales and management jobs within the company. In 2000, the company acquired Apex Supply Company, a wholesale distributor of plumbing, followed by the purchase of Your "other" Warehouse, a specialty plumbing-supply store chain, in 2001. With an eye to the international market, Home Depot bought Total HOME, a four-store chain in Mexico, in 2001. In 2002, it purchased Del Norte, a four-store chain in Juarez, Mexico. It planned to open two more Del Nortes in Mexico by the end of the year. The sales associates at Home Depot stores are often able to teach customers how to use the tools and products they are buying. As of June 2002, Home Depot had a total of 1,400 stores, including 83 in Canada, seven in Puerto Rico, and four in Mexico, and 251,488 employees. It posted $53.6 billion in sales in 2001. The company leadership underwent a dramatic change in January 2002 when cofounder Blank resigned as CEO (he had taken over the position in 1997). He was replaced by president Robert L. Nardelli. Marcus left the board of directors in May 2002, when he reached the company's mandatory retirement age of seventy-two. Home Depot's tall aisles help keep them well-stocked with in-demand items. plan to expand into the service arena, adding such things as carpet installation, lawn care, and pest control. In light of all the changes, Nardelli intends to address complaints that Home Depot has lost some of its commitment to customer service, including Marcus's original vow that when a customer asks where a product is, the employee will take the customer to where it is. "We've got to make our stores more shoppable, more navigable," Nardelli said in a 2002 Money interview. "While we're No. 1 in home improvement, I want to make sure we're No. 1 in every segment of home improvement." The article is interesting. What would be more interesting is how Home Depot treats its employees. At one time Home Depot was one of the top 100 employers to work for. Today they don't even rate in the top 100 employers by state. It is interesting to note that Home Depot a multi-billion organization was build by not only by its founders but its employees. The past leadership gave thanks to the employees by cutting their benefits, how nice. Now the management telling the employees to sell off their shares to the company. What is also interesting that top management doesn't have too. That means less shares on the market and driving their stock value higher............hmmmmmm I wonder why? Nardelli not only cut back on the amount of stores he also drastically cut back on perks and benefits for the employees in "the trenches" of all HD stores. Jim Kramer (of Mad Money) used to wear a t-shirt with Nardelli's picture on it with the inscription "I wrecked Home Depot, and all I got was this t-shirt and $200 million dollars." Home depot used tobe a great place to work. Now it is no better than a third world sweat shop.